There's something so appealing about an old barn door and this look has been created using natural pine slats, overlaid with two crossbeams and finished with faux hinges and hardware. Handcrafted door plaque is lettered with strong sentiment to bless the soul and warm your heart. Includes sawtooth hanger for easy wall display. 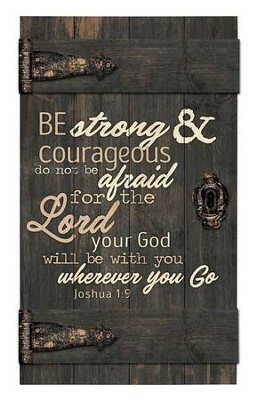 I'm the author/artist and I want to review Be Strong & Courageous , Door Art.